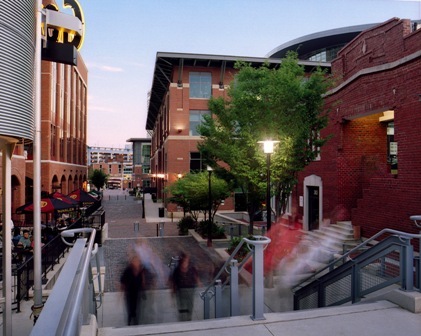 Acock Associates is located in the heart of Columbus' vibrant Arena District. Acock Associates Architects' office is located downtown in the Arena District. Our office is set back from Front Street behind a single row of buildings. Walking to our office is simple. From Front Street, turn down the alley between Gordon Biersch and Steak Escape. Continue down the alley beneath the overhang, then to an open space. Our building will be in front of you, just slightly off to the right. Our office is located on the second floor. Client Parking is available behind our building in the Founders/VIP Parking garage. This parking garage can be accessed off of Neil Avenue by turning East on Brodbelt Lane and following the curving road past the brick McConnell Parking garage and back to the concrete Founders'/VIP garage. For a Client Parking Map, click here. Public Parking is available all around the Arena District, in surface parking lots, parking garages and metered street parking. For an Arena District Parking Map, click here. Please don't hesitate to call our office with any questions or concerns.